GeorgiaDogs.com has photos and news about Uga VII's introduction on Saturday. Included in the press releases are photos of the new mascot (see right as well). His name is "Loran's Best." Apparently, Uga VII will be introduced before the 12:34 pm kickoff, but the announcement doesn't plainly spell out "be in your seat X minutes before kickoff." I guess just get there about a half hour early. A video tribute to Uga VI will be shown on the stadium scoreboard prior to the official introduction of Uga VII. Separately, the Dawg Walk is about 1:45 before kickoff. FWIW, 960 the Ref in Athens has been reporting all week that an Uga VI tribute will be shown at 12:15 and that VII will be introduced at 12:19. What a damn good lookin dawg! Very stately! "Damn, I wish I could do that." Anon: According to the linked Macon article, UGA VII is 3 years old. I know there is alot of time between now and UGA/ASU but I have never been to away game and I figured what a better way to make my first road trip then flying out to the desert. 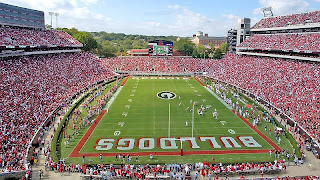 With all that said does anyone know or think they will have a DAWG walk for that game? I would imagine they would with the amount of people that are traveling. I kind of hate that this one (like the last one) is named after Loran. Don't get me wrong, Loran's a great ambassador for us and a big fixture within the Athletic Association, but I would've liked to have had this one named after Munson...especially since Munson's never had one named after him. Guess we'll have to keep Larry around for the next 10 years or so. yeah, no offense to Loran, but why have 2 of the 7 Ugas been named after him? seems excessive to me. I don't think the name was specifically picked to honor Loran in this case. I think it was simply chosen (probably when the pup was born) for him to be named as "Loran's Best"..as in UGA VI (Whatchagot Loran)'s best. Which if true gives him a damn fine start. That is a freaking awesome looking dog and I have faith he will have as much success as his forbears. But you are right...next time get Larry's name in there. Alright, thats the last time I comment without reading the whole article. It seemed like a logical assumption at the time. I'll just punch out now and start preparing for tomorrow's tailgate. He looks young. Any idea how many pups they keep 'waiting in the wings' in case something happens to the current UGA?